The Arizona Cardinals failed to draft Carson Palmer’s successor, so they’ve turned their attention to Blaine Gabbert as a potential backup. The Arizona Cardinals need to find a quarterback of the future, with Carson Palmer perhaps heading into his final season in 2017. Having the No. 13 overall pick in the this year’s draft put them in position to get Palmer’s successor, but Mitch Trubisky, Patrick Mahomes and Deshaun Watson were all off the board by the time the Cardinals went on the clock. Drew Stanton and Zac Dysert are still in place behind Palmer and Trevor Knight was added as an undrafted free agent. But the Cardinals are apparently still looking to add some competition under center, with a former first-round pick on their radar. According to Aaron Wilson of the Houston Chronicle, the Cardinals are in talks with free agent quarterback Blaine Gabbert. The No. 10 overall pick in 2011 by the Jacksonville Jaguars started 13 games for the 49ers over the last two seasons, but the new regime in San Francisco let him hit free agency without an offer. Gabbert would compete with Stanton most directly to be Palmer’s primary backup, and he would theoretically be the favorite. That sentiment says more about Stanton than anything and points to why Arizona wants some competition for the No. 2 spot on the depth chart. 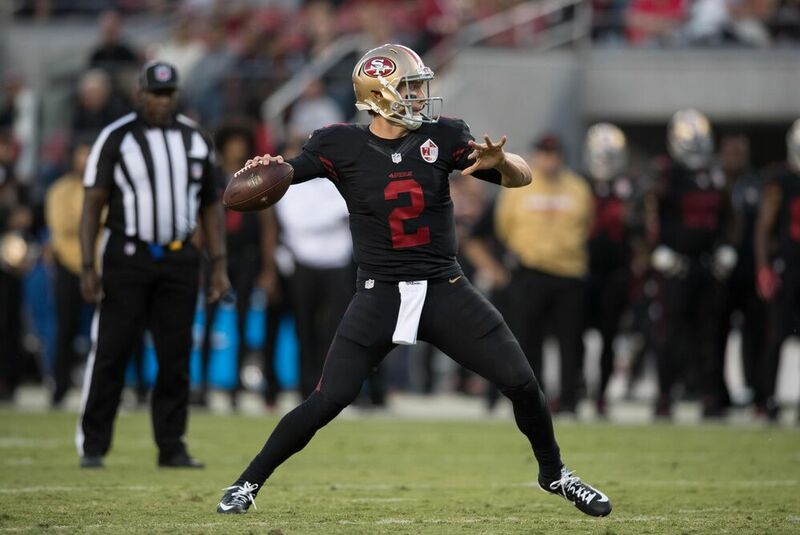 But Gabbert did show he can be a functional quarterback in 2015, with a 63.1 percent completion rate and over 260 passing yards in four of his eight starts. The Cardinals possible signing of Gabbert is interesting, with Colin Kaepernick and Jay Cutler also still available. But Cutler in particular probably wants a chance to win a starting job, with the Houston Texans reported to not have returned his calls, and retirement may be on his radar. Kaepernick still comes with possible off the field backlash, even as a backup quarterback, though he actually replaced Gabbert as the 49ers’ starter last season. Gabbert has had no known interest on the open market, so he’s in no position to be choosy. An opportunity to compete for a job is there in Arizona.